This is a full reworking of Magnum Opus, with cleaner graphics, and streamlined code to make it run smoother with Android Wear 2. it features Digital display panels over an all new speaker grille background graphic. There isa tap action to change colour located on phone battery level indicator. you can activate an incremented by 10%in 10s, up to 80% dimmer by tapping on watch battery level indicator, and update weather on left end of the weather indicator. tap centre of time bar to show date bar overlay, which fades away after three seconds. 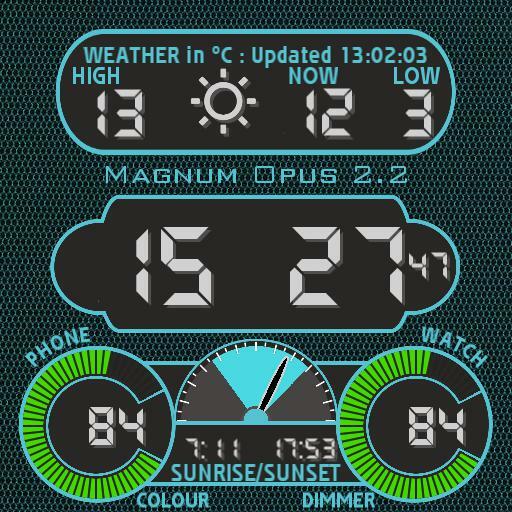 tap sun phase indicator to show moonphase indicator, which fades away after three seconds also. Tapping on the right of the date bar will switch from 24hr to 12hr display and another tap will switch back to 24hr again. twin displays for battery levels and charging indicator icons. day, date with date extender, month, 24hr/12hr time, blinking time separator which shows seconds. shadows on all variable assets. I havent added a proper dim/glow because my preference is for my watch to fade to black after five seconds, with tilt to wake activating the display again. owing to one individual who edited one of my designs, replacing my name with his, and making an ugly as hell amateur botch-up change to the display, attempting to pass my work as his, I now lock all my watches. One rotten apple spoils the whole barrel.